Down below the Old City of Tzfat, towards the base of the mountain, lies the famous cemetery of Tzfat. People come to the cemetery from all over the world, to sit, pray, beseech, or simply be in the company of the great rabbis who are buried there. The most famous of these rabbis is Rabbi Isaac Luria, also known as the ARI. The ARI came to Tzfat in 1530 from Egypt. He was one of the most famous Kabbalists of all times, and while in Tzfat, legend has it, he learned new Kabbalistic insights while studying with Elijah the Prophet in a cave in the synagogue located above the cemetery - today named the ARI Sepharadic Synagogue. Hassidim revere the ARI, and the anniversary of his death every summer is a time when thousands of Hassidim come to pray at his tomb. The grave of the ARI is the most notable gravesite in the cemetery, with a platform built around it to make it easier for people reach the site. As with all the graves of the great Rabbis in the cemetery, the ARI's grave is painted a deep blue. Next to the ARI is buried his son, Rabbi Moshe Luria. There is a tree that grows out of R' Moshe Luria's grave. A tradition has grown out of the hanging plastic sacks on the tree and each sack holds a petition of a visitor to the grave who is asking for R' Moshe's intercession with the Divine regarding some aspect of their life. 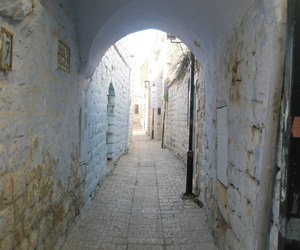 In the same area near the ARI is Rabbi Moshe Alsheich, best known for leading the movement to reaccept Jews who had been forcibly converted to Christianity, and who wanted to reenter the Jewish World. At that time, many Jews were reluctant to allow this, reasoning that their conversion indicated that they weren't fully-committed Jews, but R' Alsheich wouldn't accept this reasoning, and his stature convinced the Jewish authorities of his day to allow these Jews to return to Judaism. Also next to these great Rabbis is Rabbi Shlomo Alkabetz. Rabbi Alkabetz is best known for composing the Lecha Dodi song which is sung every Friday night to welcome in the Sabbath. R' Alkabetz was a Kabbalist, and he wrote the Lecha Dodi in accordance with the Kabbalistic belief that, during the week, each one of a Jew's actions creates an angel. On Shabbat, these angels join the individual as he brings in the Sabbath Queen, and Lecha Dodi, "Come my Beloved" reflects this. Below the ARI's grave is that of Rabbi Yosef Caro. Rabbi Caro is best known for writing the Shulhan Aruch, the Code of Jewish Law, in Tzfat. A Kabbalist and a Torah scholar who was concerned with the day-to-day observances of the Torah's commandments, R' Caro wrote the Shulhan Aruch to make the laws of the Torah easier for Jews, who because of the Spanish Expulsion, were being dispersed throughout the world. Tradition states that R' Caro wrote the Shulhan Aruch with the help of an angel, The Maggid, in the location where the Yosef Caro Synagogue is now located. While the cemetery is best known for the great scholars from the Middle Ages who are buried there, it is also known as the burial grounds for Jews who lived in the area thousands of years ago. Some of the oldest graves that are known there are those of Hosea the Prophet, R' Pinchas Ben Yair (father-in-law of R' Shimon Bar Yochai, composer of the Kabbalistic Book of the Zohar in the 1st century A.D.) and, some believe, Chana and her Seven Sons of Chanukah fame.